I can't believe how fast time is flying by now. I have three weeks until my race! This week was pretty much awesome when it came to my training. 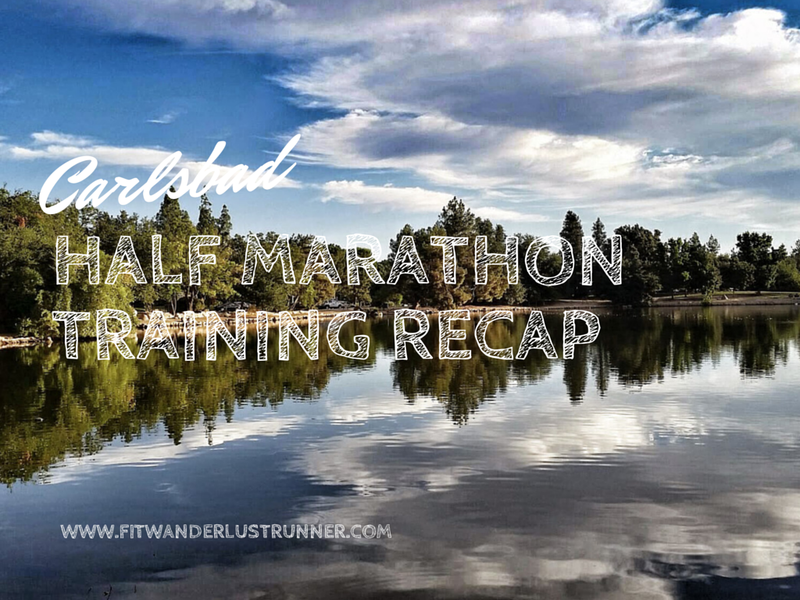 This week was all about increasing mileage and doing an 11 mile run. It's like everything lined up perfectly! Not only did my 11 mile run go perfectly but it was pain free. Like I said earlier, my goal is not to PR but to run pain free. It's really weeks like this that make all of this training worthwhile. I know in the future there may be set backs but this week is what mentally prepares you for race day. 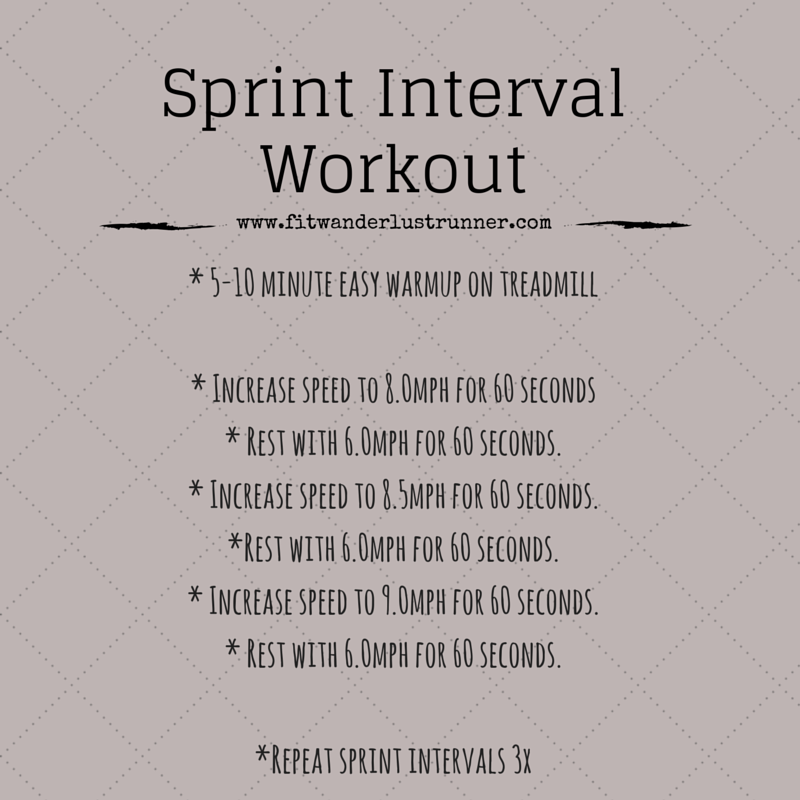 SUNDAY: I needed to do some sprints so I went to the gym after work and did a quick treadmill workout. It was great because I actually was able to increase my speed. I'm hoping I'll be able keep increasing speed as the time passes by. Sprints and hills are my weakness, but they are what has helped me in the past year to drop my average pace. You have to do the work in order to get the results. MONDAY: My husband and I went for a quick 2 mile run after my work shift with our dogs. 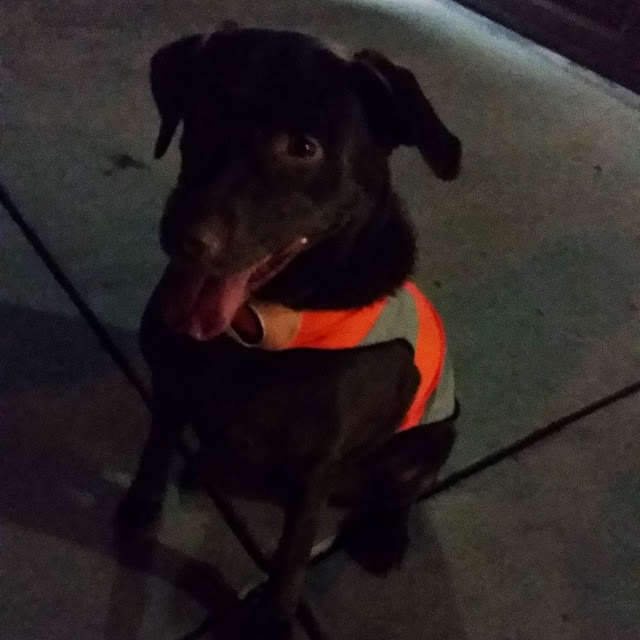 Kona got to wear her new night running vest. She is just too adorable! Proud of my husband for doing two miles. Doesn't sound like a lot but it was for him. He's been running 4-5 times a week with our pups. 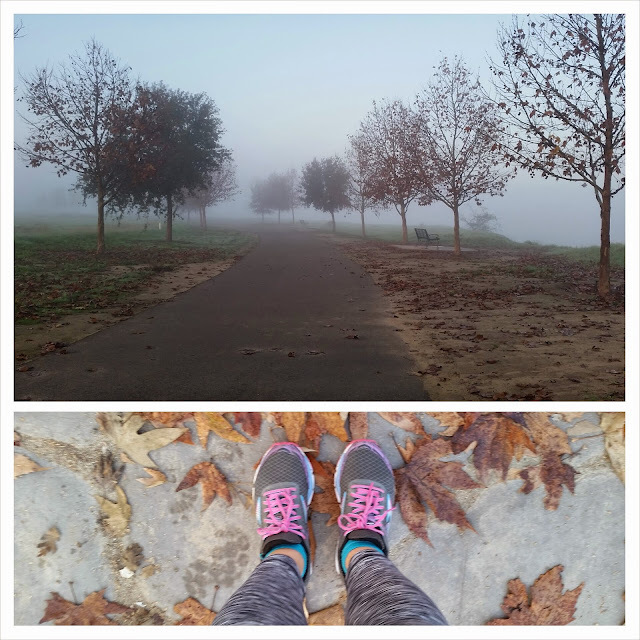 TUESDAY: Went out to Woodward park and ran 6 miles in the fog. 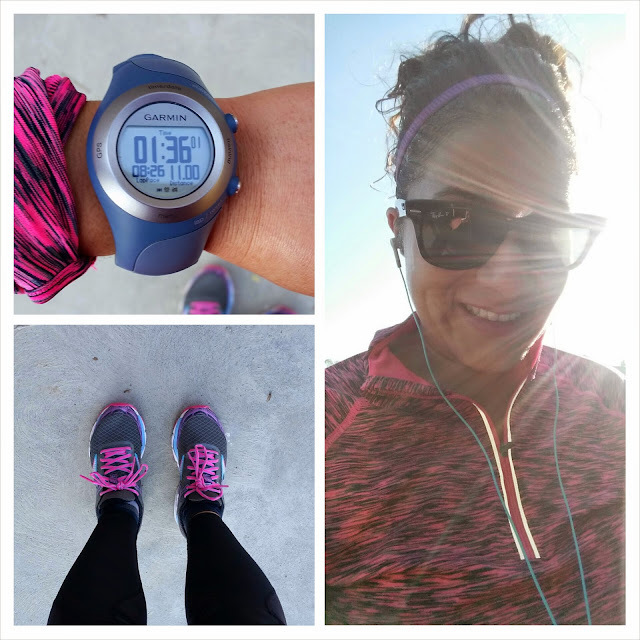 I wanted to get some rolling hills in order to get me prepared for those little hills in the Carlsbad course. No Garmin...just me. I really love running in the fog. It just looks like I am running into the abyss, the unknown. My running partner was unable to meet me for this run. WEDNESDAY: Christmas Eve...I slept in and didn't make it to the gym before work. Womp...womp. FRIDAY: Woke up late but was super mentally prepared for my long run...11 miles. I did so well! Average pace was 8:43...I was so ecstatic about my pace. Now I know that for many runners out there this is nothing, but I have come such a long way to get to where I am. The first two miles I ran about a 9-9:10 pace, but after that I caught on to my running groove. Best part was that I had no pain during the entire run! SATURDAY: I met my running partner at our favorite park for a fun 6 mile run. Oh man it was soooo cold in the morning. Glad we followed through and finished, but my running partner was sure cursing my name at the beginning of the run. 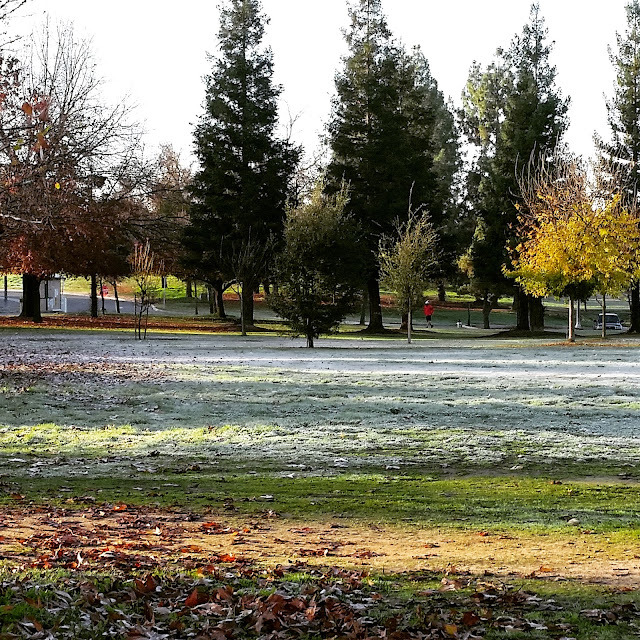 There was frost on the grass and on the trail. I know it's colder in other parts of the world so I shouldn't complain. Props to all of you east coast runners! This upcoming week I want to do one more long run before I start to taper for the race. I will also do some hills and sprints again. Not sure if I'll do these at the gym or outside. These have become a staple in my training. This past week I was unable to make it to a spin class, so I am hoping to get some form of cross training to ease up on my feet and legs. Has anyone ever tried running in the pool? I'll be in San Diego in a few days so I am looking forward to a change of scenery. Did you have a great training week? How many miles did you log in this week?